It’s not every day that you get to see yourself in print and, sadly, this isn’t one of them either, but I remain hopeful. 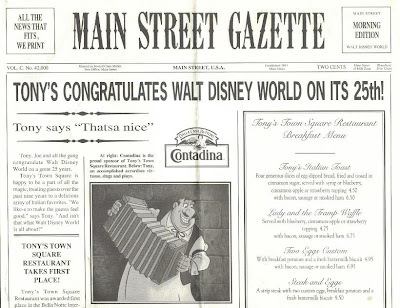 It is however, a copy of Main Street U.S.A.’s Main Street Gazette, the publication for which this site is named. This Gazette was created as part of the celebration of Walt Disney World’s 25th anniversary. The paper included stories on Tony’s Town Square Restaurant, the new additions to the Walt Disney World Railroad, the tasty treats and music selections of Main Street U.S.A., SpectroMagic and Remember the Magic Parades, and an special article on the anniversary of the day that Lady and the Tramp first met.